After much planning, we finally got to do some Great Smoky Mountains camping last month! In this post, I’m sharing everything you need to know about camping in America’s most visited national park to help you plan a visit of your own. 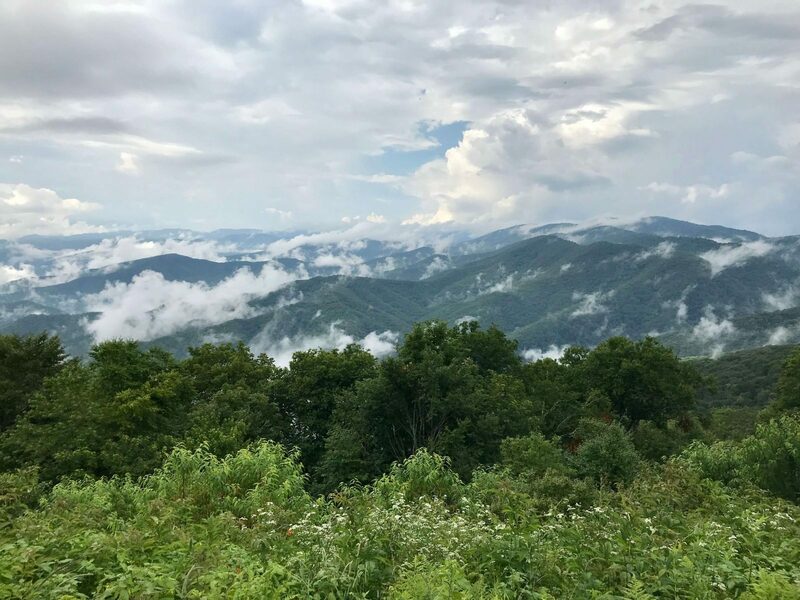 Great Smoky Mountains camping is a great way to relax and unwind in a gorgeous national park that is one of our country’s gems. If you have visited some of America’s national parks before you might be expecting to stop at a booth and pay an entrance fee to visit the park (for example, we paid $25 to visit Everglades National park earlier this year). But Great Smoky Mountain National Park (GSMNP) is one of the few large national parks that doesn’t charge an entrance fee! It is totally free to visit. 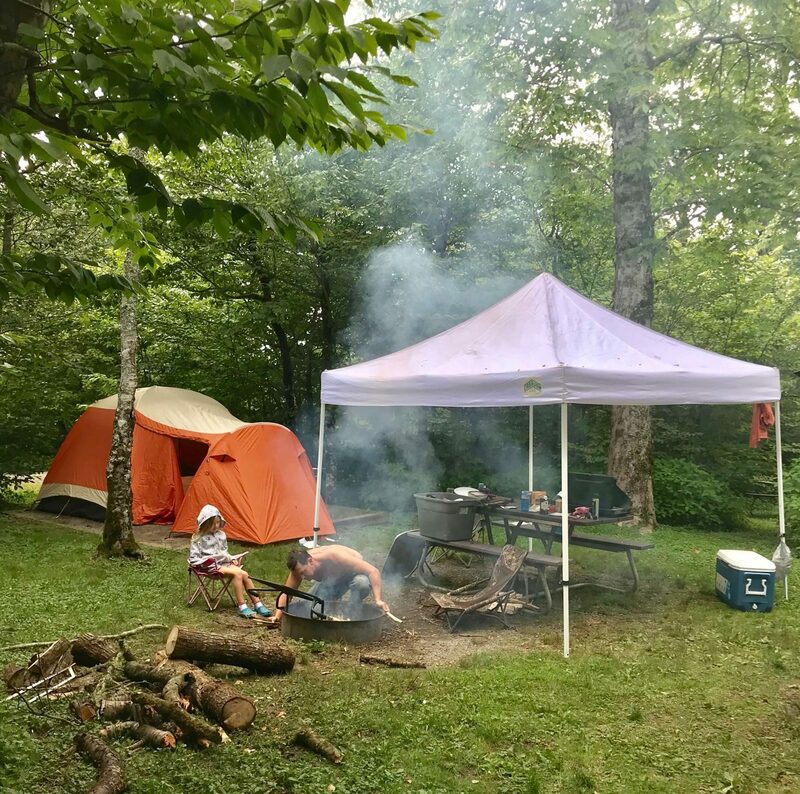 There are ten established “frontcountry” campgrounds located within Great Smoky Mountains National Park that are run by the park service. Frontcountry means you can access these campgrounds by car and drive right up to your campsite. The campgrounds vary in size and elevation but not in amenities (more on that in a second). Check out this super helpful chart that compares the size and elevation of all ten campgrounds. Great Smoky Mountains camping will cost between $17.50 and $27 per night at any of these ten campgrounds. We visited in the middle of July when it commonly gets above 90 degrees in North Carolina during the day. 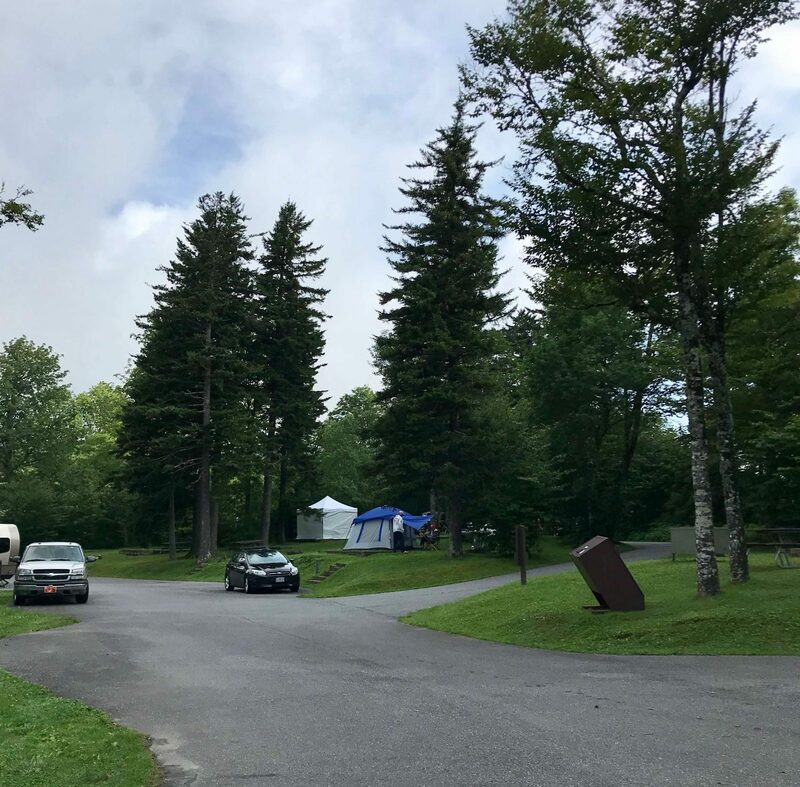 Since we were camping in our tent and like to be cool while sleeping, we chose the campground at the highest elevation in the park – Balsam Mountain Campground. Since this campground is located over 5,000 ft in elevation, the weather was MUCH cooler than those at lower elevations. In fact, we were downright cold at night and were glad we brought our cool weather sleeping bags! Keep the importance of elevation in mind so you are not sweltering in the summer or freezing in the spring and fall. As is the case with many national parks, there are no showers in the Great Smoky National Park campgrounds. Shower facilities are available in the communities surrounding the park – just ask the campground host about the nearest facilities when you check in. There are also no electrical or water hookups in the park. 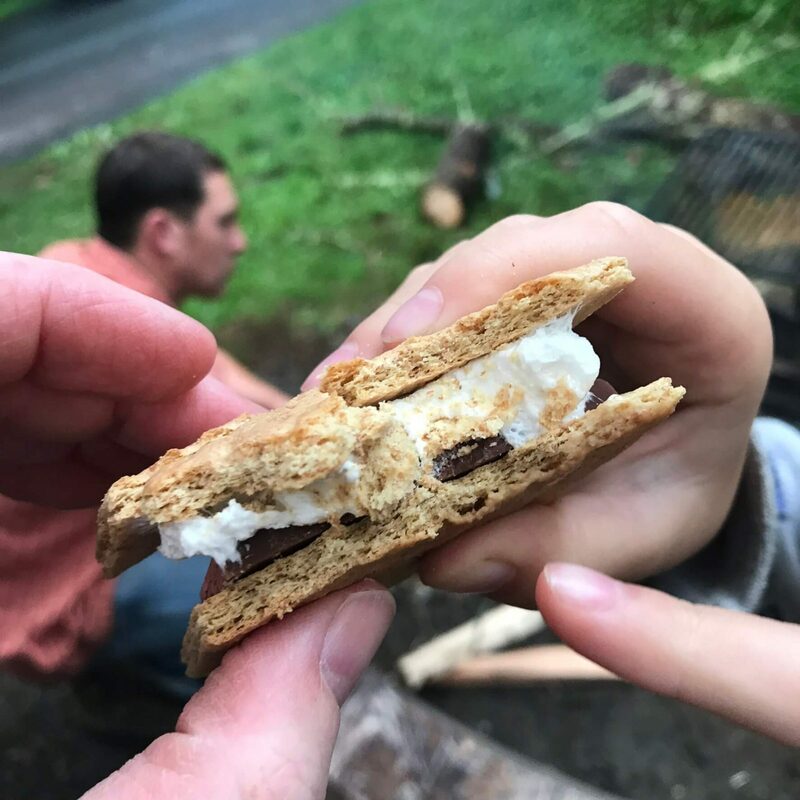 Knowing what you’ll find at your Great Smoky Mountains camping site will help you have the right expectations for your trip! Each campground has restrooms with cold running water and flush toilets. Each individual campsite has a fire grate and picnic table. Most campsites at our campground had a tent pad, but not all. The restrooms were ingreatt condition and were kept very clean. There was one section of our campground that was dedicated to tent-only camping. We liked our campsite – we had some privacy from neighbors but were close enough to the restroom. 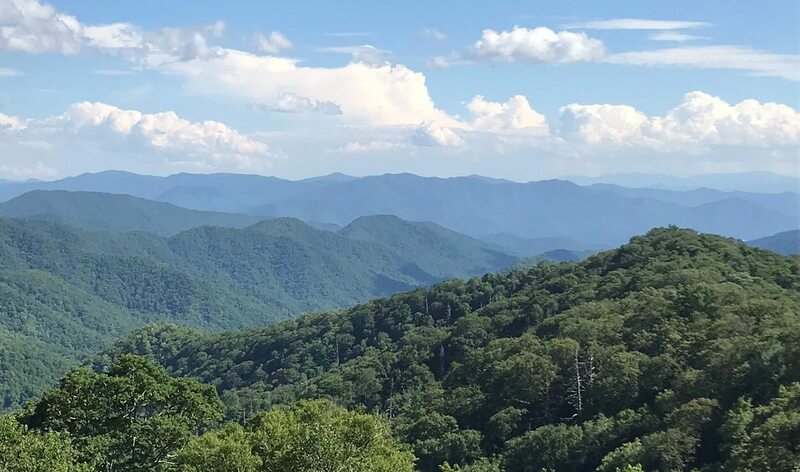 We didn’t know that we needed reservations for Great Smoky Mountains camping, but it turned out that we did! Advance reservations are required at Abrams Creek, Balsam Mountain, Big Creek, and Cataloochee Campgrounds. You can make your reservations online here or by calling (877) 444-6777. 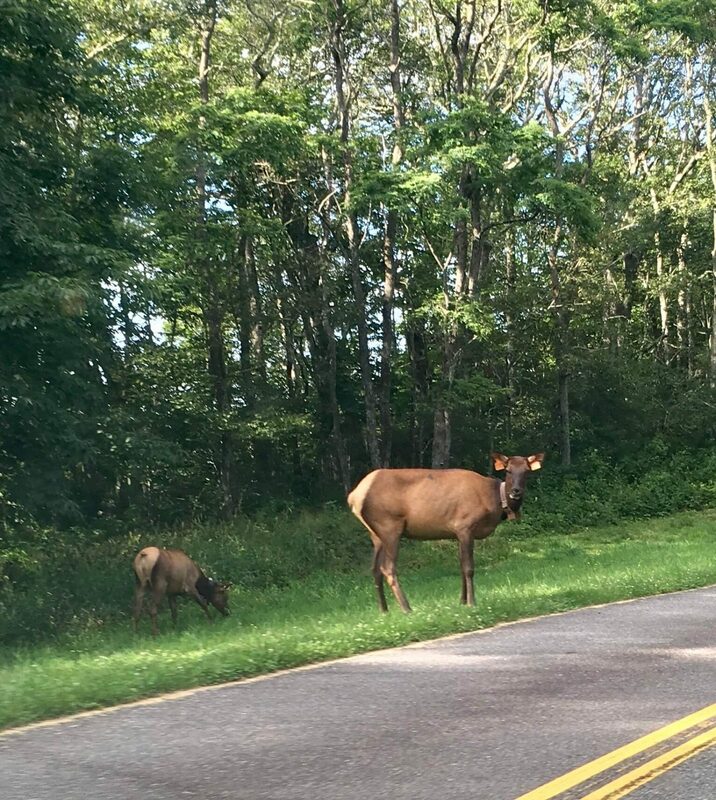 Additionally, you can make reservations at Cades Cove, Cosby, Elkmont, and Smokemont campgrounds, but they are not required. All other campgrounds are first-come, first served. The park straddles two states (North Carolina and Tennessee) and is over 800 square miles in size. It can easily take several hours to drive from one section of the park to another. Use this park map to plan what section of the park you’d like to visit and try to find a campground close by. This may depend on which direction you are coming from, or on what you’d like to see and do. A regulation that is strictly enforced in GSMNP is that when not in use, food and cooking supplies are secured in your car. There are many black bears in the park. They are attracted to food and the park service has this rule to keep you safe. During our visit, a bear walked through our campground looking for food (seriously) and the second morning it did this the park service was ready – they tranquilized, tagged, and moved the bear to another part of the park! Be ready with a cooler and/or crate to easily move food in and out of your car. We keep all of our cooking supplies in a large Rubbermaid container so it is easy to put away when we are done cooking. Beginning in 2015, only heat-treated firewood that is bundled and certified by the United States Department of Agriculture (USDA) or a state department of agriculture may be brought into the park. Campers may also collect dead and down wood found in the park for campfires. This is to protect the park from invasive insects and diseases that affect trees. So, unfortunately, you can’t bring firewood from home, but you can bring a saw or hatchet to collect some of your own. Since 2013 Great Smoky Mountains National Park has required a permit and advance reservations for all backcountry camping in the park. This is camping at any site that you have to hike into. There are almost 100 backcountry sites which you can locate on this trail map. You can only camp at designated backcountry campsites and shelters. Great Smoky Mountains camping in the backcountry is $4 per person per night, with a maximum of $20 per person. I like to bring pre-cooked meat (such as the smoked chicken I used to make this dinner) since I then dont have to worry about contamination from raw meat. Stick with basic meals, such as chicken, veggies, and cheese with instant boil-in-a-bag rice, or hot dogs and baked beans. 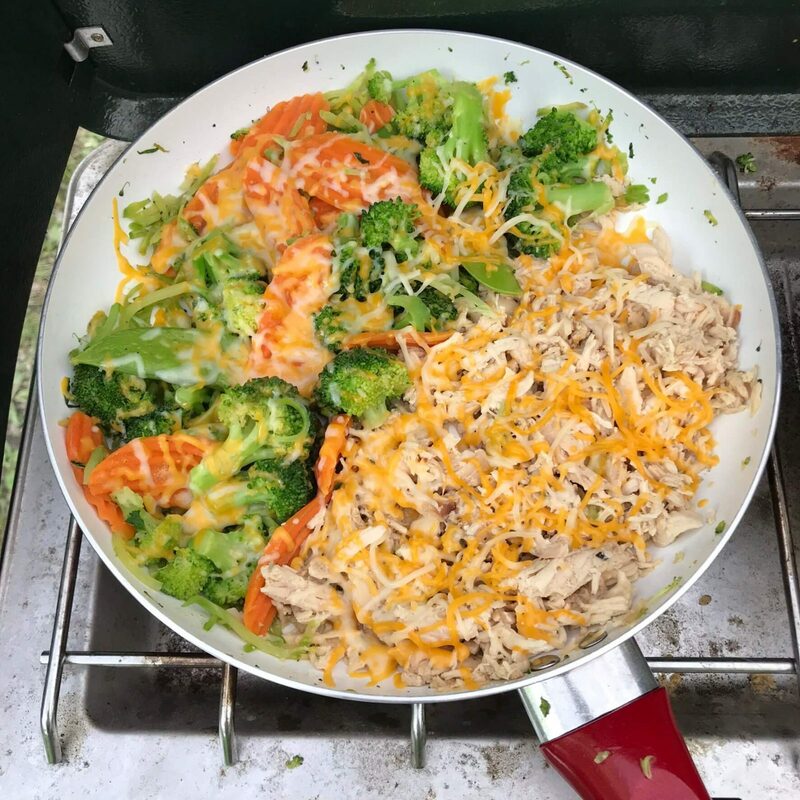 Most everyone camping at our campground had a two-burner propane camp stove like ours – get one at Target for only $39.99 here. We use a super simple $7 drip coffee cone to make coffee while camping. I love getting camping snacks delivered ahead of time from Brandless – everything is only $3 so the sizes are perfect for our camp box. Sign up with my link to get $6 in free snacks in your first order then check out all of their items perfect for camping here! 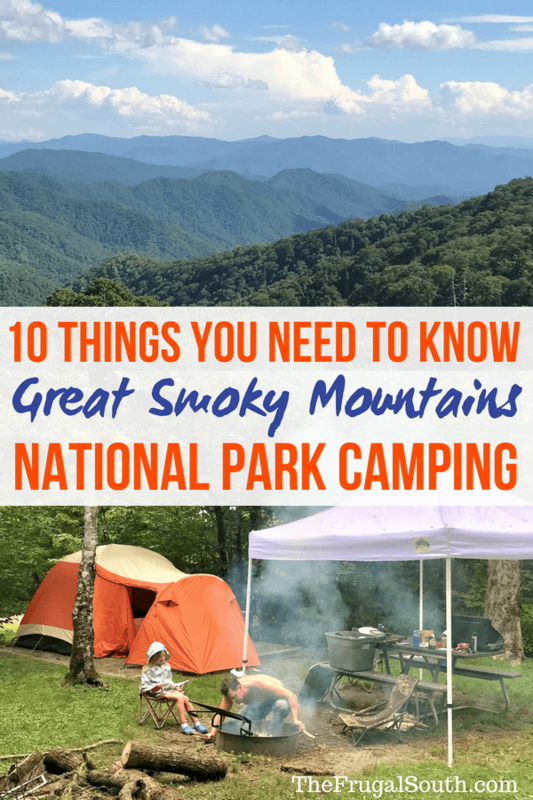 I hope this post answered your questions and gave you some inspiration for Great Smoky Mountain camping. It is such a beautiful place to visit and a great way to spend some much needed time in nature. Any questions? Please leave a comment below or send me a message on The Frugal South’s Facebook page! We took a family vacation to the Smokies a couple of years ago. We spent a good bit of time driving through the park and on short hikes, but our kids were young and not up for the longer hikes yet. I’m hoping to get back there soon and camping may be a possibility, so thanks for all this info.